Ever since my fourth grade teacher explained to me and my classmates that our classroom computer was hundreds of times faster than the computer which sent a man to the moon, I've been fascinated by how NASA has affected technological innovation in the U.S. and the world. Living in DC I have the ability to take a short walk and see the spacecraft which actually orbited the moon and brought our boys safely back to earth, and I'm inspired by it every time. After seeing Apollo 13 again a few weeks ago, I've come to realize that the space program, in particular the Apollo missions, has been a powerful inspiration for me in my pursuit of engineering craft. To put it mildly, I'm a huge fan. Last month I entered the world of 24/7 internet access by buying a fancy phone, the Motorola Droid. 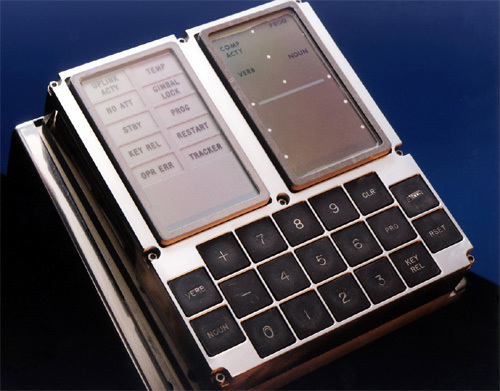 Remembering the words of my fourth grade teacher, I became curious to know how my tiny phone compares with the computer that was used onboard the Apollo 11 moon mission. I knew my phone would be many times more powerful, but the nerd in me wanted to see some actual numbers. So here, for your enjoyment (if you're into this kindof thing), is a comparison of my phone and the Apollo 11 AGC. Difference: The Droid has 586 times the clock speed of the Apollo 11 AGC. Difference: The Motorola Droid has 7,282 times the ROM and 65,536 times the RAM of the Apollo 11 AGC. Difference: The Motorola Droid has 16 Gigabytes of digital storage space. The Apollo 11 AGC had none; everything was stored in ROM. 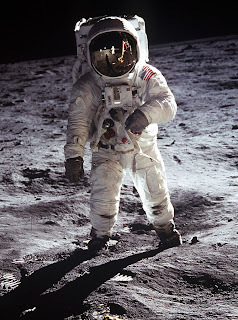 Difference: The Apollo 11 AGC consumed 95 times more power than the Motorola Droid. Difference: The Apollo 11 AGC weighed 188 times more than the Motorola Droid. By the way don't worry, even if you don't have one of those fancy schmancy phones, you've still got the AGC licked. There's no way the AGC could have handled a phone call. Download Squad: How Powerful was the Apollo Guidance Computer?